Charles Fitch | My Gospel Workers | "Redeeming the Time"
Fitch wrote William Miller stating that he had read Miller’s Lectures and did not doubt the correctness of his views. For approximately three and a half years, he held back from preaching the Millerite message. Eventually, because he preached the doctrine of “holiness” and was exhorted not to do so, Fitch felt it necessary to separate from the established church. This separation caused him to be less influenced by the fear of man regarding the Millerite understanding of the advent. 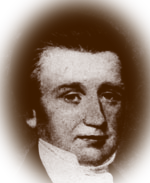 Josiah Litch visited Fitch and told him he needed the doctrine of the second advent to add to his doctrine of holiness. Litch left him more literature to study and requested he correspond as to the result of his study. This study led to his accepting the advent doctrine. Thereafter, Fitch traveled tirelessly, throwing himself unreservedly into proclaiming the need of preparation for the Second Coming of Christ. He moved his family to Cleveland, Ohio and held meetings and baptisms all over Ohio. In 1842, feeling the need of an accurate chart, Fitch and Apollos Hale prepared the famous chart illustrating the fulfillment of the last-time prophecies of Daniel. This was used extensively by the Millerites. Fitch himself used this chart and also other visual aids including a replica of the Daniel 2 statue that could be separated into its various parts. Charles Fitch became seriously ill, probably with pneumonia, in the month of October, 1844. He had chilled while baptizing converts. He died on Monday, October 14th, in full faith that he should awake in a few days in the likeness of his Redeemer.